Calling all lazy girls! This is the. easiest. recipe. ever. 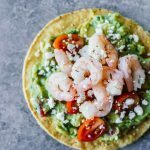 Today I’m sharing a SUPER easy 5-step 5-ingredient Shrimp Guacamole Tostadas recipe that’s perfect as a lunch, dinner, or Thanksgiving day appetizer! Now, I realize this recipe isn’t COMPLETELY festive in its nature. But stay with me, friend! There will be PLENTY of pumpkin/holiday/everything fall recipes headed your way in the very near future. And as it turns out, I may or may not have ever-so-slightly jumped the gun on the holiday festivities by basically going full-on holiday everything as soon as the clock struck midnight on November 1st. I mean, I’m not fully admitting that there’s any sort of issue with that, but maybe I just need a second to think about a food that doesn’t involve pumpkin, cranberries, spice and everything nice. Just ONE second, that’s all! If you NEED those holiday recipes in your life right now, I gotcha covered with Creamy Pumpkin Pasta, Mini Apple Pies, Apple Cinnamon Overnight Oats, and Pumpkin Curry Soup. But for now, let’s get into these Shrimp Guacamole Tostadas! This GOODFOODS Tableside ® Chunky Guacamole is SO deliciously amazing and versatile! The best part is that it requires ZERO effort, y’all. I buy it at Target and absolutely love it! If you’re looking for a life-changing guacamole, definitely head to your local grocery store (find a GOODFOODS store here!) and try this stuff out. It’s da best! Combine it with all of these toppings and a crunchy tostada shell, and we have a winner. To put it simply, friend, this easy Shrimp Guacamole Tostadas recipe is everything good in life! I just can’t even explain it through this little screen. Just come over and we’ll make/devour them together! Thaw or warm the shrimp on the stove. Top each tostada shell with guacamole, tomatoes, shrimp and feta cheese.